There are passageways in Yelapa, the small indigenous coastal community a few miles south of Puerto Vallarta, that I always walk through with intense pleasure, accompanied by a kind of heightening of the senses on the order of the first twinges of a hallucinogenic, when colors begin to sparkle and all the aromas of a landscape become suddenly present. There is nothing grand about these ways. They are cluttered and rough and frequently lined with trash; the houses along them are indifferently painted, the music from the huge sound systems therein can be unbearably loud, and the smells are occasionally noxious. Yet they are also touched by a fantastic beauty: everywhere, at every level, a garland of plants and flowers softens the landscape of hard dirt, sheet metal, plastic and concrete. 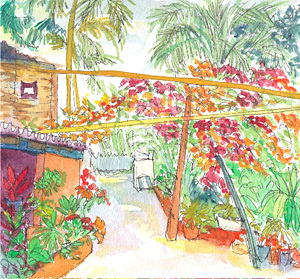 The plants are masses of dozens of shades of green; the flowers - reds, pinks, yellows, purples, blues, every shade of hibiscus and bougainvillea - dot the pathways like notes in a multidimensional musical score. 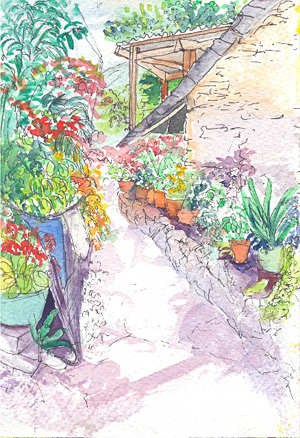 The plants have been displaced from their normal habitat, the ground, by concrete houses and paths; but the women of the town have fought back with thousands of pots and rusted cans and five-gallon paint buckets, and have reclaimed every minute unpaved strip of earth, to make even the hardest of passages an environment for plants - a soft reminder that the place was built, after all, in a jungle, for humans, who, most of them, these anyway, care about what they see around them. 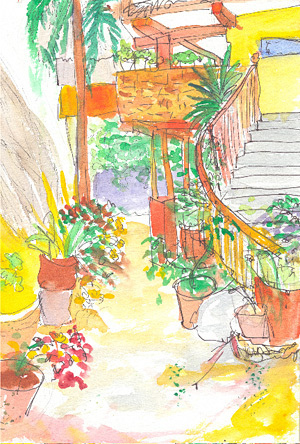 The pots and buckets perch wherever there is room, along paths, up stairways, along walls, on the tops and sills of buildings, taking up whole corners, then disappearing to give you a sense of what the place would be like without them, reappearing amid a forest of hanging clothes, whose artificial dyes blot out and marginalize the natural pigments of the flora. It doesn't matter; the vibrant growth all around makes even laundry look different, and it is not unusual to see clothes drying on a sturdy bush. Taken together, these passageways comprise an ongoing group work of art that brings the current Yelapa vernacular, a blend of the delicate and the crude, into focus. As all styles do, that style is evolving; it is currently working through a major mutation that began seven or eight years ago after the boulder-strewn pathways over which Yelapans then picked their way were hardened and smoothed with a layer of cement and round paving stones. That led immediately to the introduction of the wheel, which had been previously almost unknown in Yelapa; goods had previously been transported by horse, mule, donkey, or human muscle. Local cargadores stacked four or five cases of beer on their backs, secured them with a tumpline, and uncomplainingly set off into the coastal hills. Transportation was mainly on foot or in a saddle. With paved paths appeared wheelbarrows and small boys on bicycles, the latter of whom briefly terrorized the populace by seeing who could ride down every hill fastest. Eventually the bikes broke down and the boys' fathers discovered the four-wheel all-terrain vehicle. Used first purely as a mechanical horse, these rigs quickly caught on with the young male set and now zip around town in ever-increasing numbers, hauling goods, kids, girlfriends, and occasional whole families, to the point where there are now occasional small traffic jams on narrow paths and the first crude speed bumps have appeared. The bikes have been shunted aside in favor of work and adult joy-riding. This change was politically inspired in that the money for cement and labor to lay the paths was paid via the Mexican government of Cabo Corrientes, the province in which Yelapa, and its parent indigenous community of Chacala, are located. This new force was invited to Yelapa by a dissident political faction that challenged Chacala's own political leaders, who had pretty much run the community as they wished since it was chartered by Felipe II of Spain in 1581, and probably for centuries before that. Unable to get satisfaction from Chacala, which restricts the indigenous franchise, the local dissidents turned to Mexican politics and forged an alliance with the businesslike PAN, correctly betting, in a town long ruled by the ruling PRIistas, on the party that proceeded to elect the next two Mexican presidents. Turning out Yelapa voters for the PAN turned on a shower of benefits from all political factions, including electrification of the village, the chartering of a high school, the construction of a municipal pier, and paving of the paths - plus many more promises of goodies to come, including a municipal water supply and sewer system, whose hardware is in fact now in place, though, as of the beginning of 2009, not yet functioning. Slowly, Yelapa began to upgrade. The pueblo had long been quietly famous as a spot into which there was no traffic, since no roads lead in from the nearest highway ten miles away. The old dirt paths wandered at the whim of the protruding volcanic substrate, navigating around rocks too massive to be worth moving or dividing to flow around them like so many islands in the stream. Locals, and visitors, have long speculated on "The Road," a mythical highway that is sighted from time to time, like the Loch Ness monster, in visions of plans that have supposedly actually been seen in the secret offices of government, by somebody's cousin or friend in officialdom. When and how such a road could be built is always good for a contribution to local gossip. It's a hot topic because everyone recognizes that Yelapa with automobile and truck traffic will be physically changed forever, in obvious ways that many people don't want. And yet many others are tired of paying the equivalent of six or seven dollars for a boat ride down the coast instead of fifty cents for a bus, and paying more money for everything else sold locally to boot. None of this speculation ever included the possibility of penetration from within. Yet without a road in, the road has effectively arrived, a development that could support a Zen koan. But the local pathways bring the town no closer than ever to cheap transportation. A dozen years ago it took matters into its own hands by bulldozing a crude dirt highway over the mountain to Chacala; this serves as a means to truck in heavy equipment, and provide crude local transportation to Chacala and on to El Tuito. This road washes out every summer and isn't considered the Real Thing; but recently a few intrepid entrepreneurs have taken to using it for tours to the interior, and a windsailing crew maintains a jumpoff spot at the top of the hill. If commerce comes, civilization can't be far behind. Meanwhile along the paved and plant-lined pathways, Yelapa's architectural vernacular is changing as one looks. The concrete cube long ago supplanted the sprawling rounded palapa as the basic unit of housing. Palapas are impromptu buildings that demand skill and adaptability to build. Many long poles and bushels of palm fronds have to be harvested from the surrounding hills. The poles have to be debarked, fitted, and lashed together, and treated against wood-chewing ants; the palm leaves split down the center vein and laced together from the top, changing handedness at each step. Each palapa is different, although there are recognizable sub-styles such as conical roofs of varying pitch. As soon as they are built, palapas are attacked by the jungle, ants ravaging the poles, time making the palapa brittle, scorpions taking up residence among the leaves. Every seven years the palapa fronds that crown the ridgepole have to be replaced; every twenty-five or thirty years, the whole roof. Today that replacement may well be a few sheets of lamina, a rigid molded roofing. Palapas, which used to dot the village, survive as a few showplaces near the shore and relics deeper in the jungle. In their place has come the concrete block house, examples of which now cluster around the commercial center, the playita, line the town's two rivers, and climb into the hills. Yelapan men used to mix cement into concrete in crews of fifteen or twenty wielding long-handled shovels on large piles of sand and gravel. This technical progress came along just in time to support a local building boom as Yelapa began to feel the impact of the global communications network and the economy it supports. Once a quiet hideaway that got by not only without roads, but without electricity or any visible government either, Yelapa has quietly transformed itself into a jungle node on the Network Frontier that offers haute cuisine, lockable houses, and Internet access along with the traditional sunsets, margaritas, and tropical charm. When the world came calling on the Internet, accommodations were quickly filled up and long-term visitors began subletting their houses for profit. There are now 65 houses for rent on the website yelapa.info, and a dozen more at PalapaInYelapa.com. Craig's List also has frequent rentals and many renters have their own websites. Local owners have responded by raising rents and building their own new houses everywhere, some of them quite grand, or at least reaching for grandeur. The town is a long way from the "palapa in Yelapa" that so euphoniously celebrated the early stages of tourism there. The building boom is product of three outside forces: the Internet itself, which makes it possible for anyone in the world to look at a Yelapa house and rent it online; the real-time global economy, which links investors and developers everywhere; and FONATUR, the Mexican governmental tourist agency that acts as a bank for developers and is actively promoting designs to triple the number of tourists coming to the Bay of Banderas, on which Yelapa and its explosively growing neighbor, Puerto Vallarta, sit. These designs are well under way, and the question of whether a road is built to Yelapa may depend finally on whether FONATUR thinks local tourism can best be served by yet another Mexican beach town or by the special kind of theme park that Yelapa is now becoming. For Yelapa has joined the global net. A Google search on the name turns up 130,000 hits, fifteen times what it was only five years ago. A whole class of new visitors has discovered the town and taken to its laid-back ways, dutifully visiting the waterfall, taking the yoga classes, and boogieing at the Yacht Club on Saturday night. The network connection is locally intoxicating; already there is clamor for broadband Internet. Two or three houses have satellite connections, and DSL is promised for the coming year. A few expatriates here who can't wait simulate broadband with a second phone line kept always connected. The continuance of this growth is predicated, of course, on continuance of the rapidly increasing tourist rate of the past few years. That seems unsure, given conditions in the current global economic swamp; and in fact there already anecdotal signs, in the form of complaints from taxi drivers and restaurateurs, of severe drops in tourism in Puerto Vallarta and all around the bay. Yelapa spring rentals are going begging and rates are dropping somewhat. One local renter reports that his entire spring booking has been canceled. However that process works out, Yelapa has ratcheted a notch or two along its path to try and sample the best of the modern world without being swallowed by it. Absent the exterior road, it can still lure tourists from cyberspace and still maintain the remoteness that attracts people. Yelapa has somehow managed to be both remote and accessible, primitive and ever more comfortable, its land both communally owned and anarchically managed. It's quite a trick. The plants are part of it. Throughout this transformation, as mules and horses have continued to work, and to defecate whenever so moved, requiring them to be swept up after, the plants and flowers have continued to decorate and define the now hardened passageways. I think the plants have the better of it here; one can see that the animals may eventually be phased out, being slower and more obviously messier than their replacements; but the plants have shown great adaptability. They take up space subtly, they survive anywhere, they always look as though they belong. Their needs are provided for by an army of volunteers. There are of course potted plants all over Mexico; and there is nothing particularly distinguishing about Yelapa's, except the fact that they are potted here. The work is done by the local women (mostly) according to the energy and the skill and the resources available to them in the here and now. They are indispensable to any preservation of a local identity. Without them the town would have an entirely different feeling as one walked about. A descant of greens and bright colors that maintains a basic link to Yelapa's origins in the jungle, they bespeak the local vernacular, even as the passageways they live in become harder still. 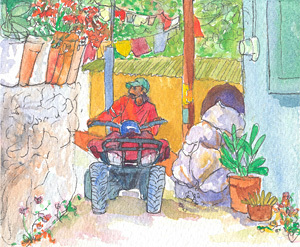 Cliff Barney and Carolina McCall are longtime residents of Yelapa.